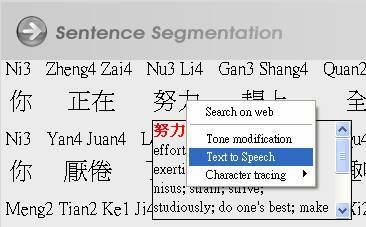 Please click Word Segmentation Mode button from the toolbar to see the Pinyin. Click Text-to-Speech or Human voice button under the Sentence Segmentation area, you will hear the pronunciations of the whole article. You can also right-click one word or one phrase, then select TTS to speech to hear the pronunciation. Note: Please record the human voice before using Human voice function. Refer to Question 1 of the Speaking FAQ.